It says a lot for Christopher Lee’s portrayal of Count Dracula that he remains inextricably linked with the role, even by many of those who have never seen a Hammer horror film, despite him having last played the part (at least officially) as long ago as 1973. Lee’s Dracula redefined the character for an entire generation and beyond. And yet, this was just a small part of a career which must stand as one of the most impressive in cinema, both in longevity and variety. Born in Belgravia, London on 27 May 1922, Lee was the son of a British Lieutenant General and an Italian Contessa. A colourful education took in Switzerland, a prep school in Oxford (along with Patrick MacNee) and Wellington College, before he became an office clerk. After the outbreak of World War II, Lee briefly volunteered with the Finnish army, before enlisting in the RAF. An eye problem curtailed his fledgling flying career, so he applied to RAF Intelligence, eventually becoming involved in the North African campaign. His war career alone deserves an article in itself, but suffice to say here that he found himself close to death on more than one occasion. After leaving the forces in 1946, Lee was having lunch with his cousin (an Italian ambassador), who casually suggested that the restless war veteran might try being an actor. Lee liked the idea, even if a representative of The Rank Organisation declared him (at 6-foot-5) to be far too tall. Nevertheless, Rank signed him to a contract, and he debuted with one line in Corridor Of Mirrors (1947). Perhaps more portentous was an uncredited cameo in Hamlet (1948), in which future friend and colleague Peter Cushing played Osric. Following the film’s success, an adaptation of Dracula must have seemed a no-brainer, and its appearance in 1958 saw Lee as a vampire count who could not only pass as a perfect Victorian gentleman, but believably charm the hell out of the ladies, perhaps a bit too believably for the censors. 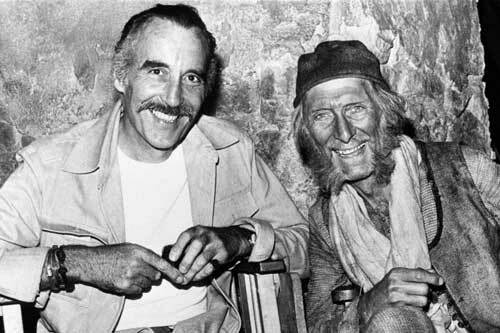 Cushing and Lee were now a box-office busting pair, and The Mummy and The Hound Of The Baskervilles (both 1959) soon followed. Other UK producers (notably Amicus) wanted some of the action, not to mention film makers in continental Europe, and Lee’s language skills saw him hopping from country to country throughout the next decade. It’s truly astonishing just how prolific he was in this period, so prolific in fact that he would sometimes protest that he had no recollection of making certain films, claiming to have been under the impression that he was making something else when he would turn up in a cameo in some godforsaken quickie, or worse, narrating a soft-core item like Eugenie (1970). Additionally, although some fine films continued to come, Lee was increasingly disillusioned with the horror field. He played Dracula a total of seven times for Hammer alone, but felt increasingly emotionally blackmailed into doing so by the company that had made him world famous. It must have been a relief for Lee to find himself on the side of good for The Devil Rides Out (1968), and its author Dennis Wheatley was so pleased with the adaptation that he offered Lee his entire back catalogue of occult thrillers to adapt. Sadly, To The Devil A Daughter (1976) would not be a success, disowned by Wheatley and marking the end of Lee’s association with Hammer. 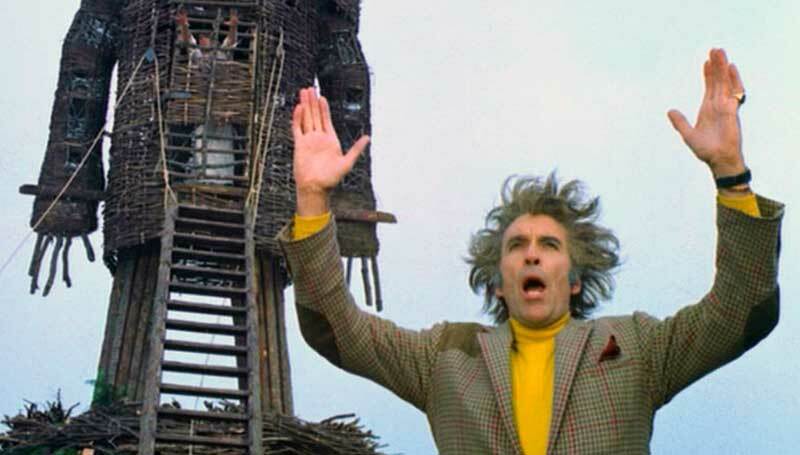 The Wicker Man (1973) might be seen as a more pleasing epitaph to Lee’s genre career, and he (along with several others from the film’s cast and crew) would tirelessly champion the revival, phoenix-like of a film which its own studio had done its best to bury. The blu-ray release of the “final cut” in 2013 must have been a source of considerable satisfaction, for Lee declared it his finest role, as well as his best film. After that triumphant performance, Lee generally sought to distance himself from the genre, wary of being permanently typecast. He was off to a flying start as a classic Bond villain (Scaramanga) in The Man With The Golden Gun (1974), as well as the dastardly Rochefort in the Musketeers series (starting in 1973), but he decided to leave for the USA to further reinvent his screen career. Once there, Lee famously turned down the role of Sam Loomis in Halloween (1978), although he later said he regretted it. An appearance as a guest on Saturday Night Live alerted the audience to his untapped comedic skills, and a new generation of film makers who had grown up watching Lee were all too eager to work with him, with Steven Spielberg, Joe Dante and Tim Burton (to name a few) all calling on his services. Lee underwent major heart surgery shortly before reuniting with his friend Cushing for the documentary Flesh And Blood: The Hammer Heritage Of Horror (1994). In a Radio Times interview at the time, Lee quipped that he had told doctors that his friend (Cushing) could do the surgery for free, but he couldn’t guarantee what he would look like afterwards. Cushing and Lee had formed another, lesser known bond, as fellow fans of the cartoons of Warner Brothers and MGM. Lee’s impression of Sylvester the Cat was guaranteed to crack-up Cushing, and the two were once ejected from a cartoon cinema for laughing too loudly. At the recording of the documentary narration, the two were joking in the studio, impersonating Yosemite Sam and Jimmy Durante respectively, despite Cushing’s frail state (he passed away before the final episode was transmitted). A return to the UK and appearance in the BBC adaptation of Gormenghast (2000) perhaps sowed the seeds of Lee’s connection with a new generation of film fans, and his appearance as Saruman in Peter Jackson’s Lord Of The Rings trilogy (2001-03) reminded world audiences why they loved him in the first place, whilst his role in the “new” Star Wars trilogy consolidated his standing. A knighthood was awarded in 2009, and he continued to work right up to the end of his life. Sir Christopher passed away at Chelsea and Westminster Hospital on the morning of June 7th, suffering respiratory problems and heart failure. British cinema has lost one of its greatest, most beloved performers. On a personal note, I have lost the man who popped up on our TV one August night in 1979, fully fanged and clad in his black cloak, and immediately convinced me that a life spent with cinema (horror or otherwise) might be a lot of fun. Thank you, Sir Christopher, and rest in peace. Growing up in the 1980s involved a lot of time loitering inside the local video shop and aided by my friend’s mum who would happily get us any video we wanted, no matter what the certificate, I saw my fair share of gory, violent ’18 certificate’ films, mostly swords and sorcery stuff, or martial arts. Most of the horror I watched in those days was late night showings of Hammer films on television, recorded on blank videos. 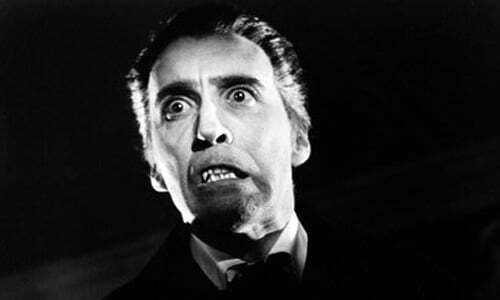 And of course, I liked Christopher Lee. I’ve always thought of him as Dracula and no one else has really been able to shift him from that position. But over the last few years I’ve become an ever bigger fan, and not just for the immediately obvious stuff like his Dracula films or the Wicker Man or even Saruman. I happily saw in the first hour or so of 2011 watching him play Rasputin in the 1966 Hammer film. In 2013 I wrote gushing Spooky Isles reviews of his contributions to the Two Faces of Dr Jekyll and City of the Dead. And as much as his height, his incredible stare, the sheer commanding-ness (not a word really, but I don’t care) of his very presence onscreen, and the costuming and make-up of his most famous characters stand out, for me it’s always been about the voice. I imagine his dialogue in scripts being written in capital letters, like Terry Pratchett’s Discworld Death. His readings of some of Edgar Allan Poe’s short stories and poems, while not as dramatic as Vincent Price’s, are great, great fun to listen to. The last I saw of him onscreen, he was the valiant Saruman, battering ring wraiths in the third Hobbit film. It’s one of my favourite scenes from the series, partly because even though you know Saruman is on a path to being Sauron’s servant and raising an army of Uruk Hai, at that stage he’s still the hero. He’s also kicking the crap out of those ghostly kings like a man a third of his age. The magic of cinema. 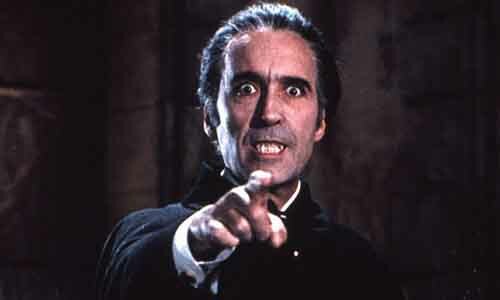 And the absolute brilliance of Christopher Lee. I’ll miss him. 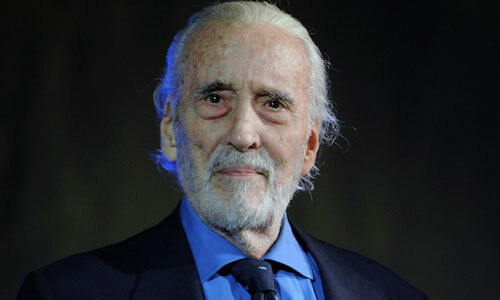 Christopher Lee is known around the world as a iconic actor. With his co-star Peter Cushing in the Hammer horror classics as a child from when I can remember I watched sat glued to the floor watching Van Helsing trying to catch Dracula wondering whether for once would Dracula beat his nemesis. Growing ‎up his name was never far from my ear from then on, soon as his name was mentioned in a film I had to watch it as I know the characters he played would.be amazing.Lord of the Rings, The Man with the Golden Gun, Sleepy Hollow, the list goes on. So for the passing of Christopher Lee‎ to me means a little more then a loss of a great actor, it feels like a loss of a childhood friend. It’s always hard to imagine a world without its great leaders. I’m not talking about politicians here but people that make a real contribution to the world. As epic as this may sound it will never be quite as epic as the life of Christopher Lee. 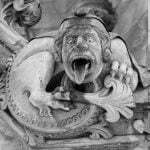 Beyond the pages of Bram Stoker stood a tall, dark and handsome creature – he shot fear into my heart and ignited a lifelong love of all things that go bump in the night. He was the monster I was allowed to watch, the one I secretly loved. Away from the red eyes, the cape and the fangs was a man with an adventurous spirit, a great deal of bravery and talent. A person who has an autobiography that reads like fiction; a tapestry of war time tales and a film career spanning decades. I have spent my adult life reading, researching and writing about the horror genre. I have spent hours in front of a TV screen, I have attended horror festivals, dedicated years of my life to studying and completing a film degree and I even dedicated part of my own publication to vintage horror. This piece of me may not have existed if it wasn’t for my first introduction to horror. I have one person to thank for this, yes, Sir Christopher Lee. I never knew you, I never met you but a piece of you will live inside me forevermore. Sleep well. Read KATIE DOHERTY’s article 90 Years of Christopher Lee that was published to celebrate Sir Christopher Lee’s 90th birthday and Bloody Britiain, at least we’ve got Hammer! in which she tells us why Hammer Horrors were the best. What is your favourite memory of Sir Christopher Lee – tell us in the comment section below! The Cutting Room 2015 REVIEWChristopher Lee: 11 amazing facts you never knew! I have enjoyed all of Christopher Lee’s films and I love his books and singing, I cannot say how much I have missed him,I cry sometimes when I watch his films on DVD and how much I love listening to his singing I never throught he wouldn’t be able to sing being a cigar smoker but I was wrong, I have cherished all his books and photos that are signed its a pity i didn’t see him when he was younger to tell him that i have visited Dracula’s castle in Transylvania as it is quite a interesting place to visit. I went in 1974.I am also the same points of views about Peter Cushing he is also a great gentleman.I have followed/supported Christopher and Peter since 1958.